Or perhaps the question should be what is Kirghiz Steppes? It’s a new collection of verbo-visual art by M. Kasper. A glance at the stunning cover photograph by Toby Kasper beckons us to visit a barely describable world of weirdness. Weird yes, but subtle enough that one may easily mistake it for our own. M. Kasper’s verbo-visual art has appeared—mirage-like—in many small press magazines and journals over the years. The artist’s exquisitely designed books—e.g., The Shapes and Spacing of the Letters (highmoonoon/Hollywood & The London Institute of ‘Pataphysics)—are legendary and highly collectible. 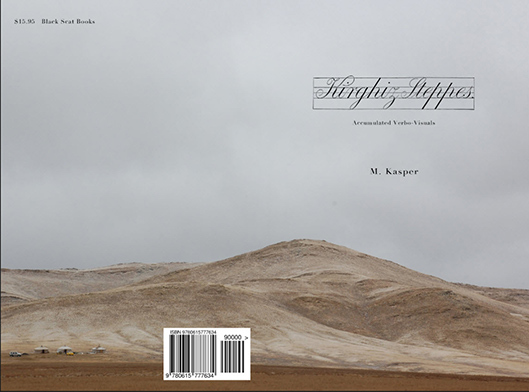 Kirghiz Steppes is a unique, limited edition album featuring one-page pieces mixing words and pictures—parodies, comics, captioned collages, concrete poems, etc.—made since the 1970’s. It is truly a world unto itself. We think you’ll enjoy the journey. A Rave for Captain Cap!